Unlike their Wax and balm which were unscented ‘The Beard and the Wonderful’ beard oil is a low scent Beard oil, this oil is a blend of Hemp seed and Jojoba carrier oils with Cedarwood essential oil. The oil is a very subtle aroma and has a very slight earthy smell from the cedarwood, Hemp Seed almost has no aroma and Jojoba has a very very slight sweet smell and so this truly is a low scent oil. The beard and the Wonderful beard oil left my beard feeling softer (it will never be truly soft) and it gave a very light hold to my beard and for those of you that like your beard feeling natural but still want the benefits of using an oil, then this will do that. The oils used apart from making your beard look and feel good, these oils will help to stop Beard itch and beardruff and a good oil will also promote healthy strong beard growth. I have to admit that I did miss using a scented oil, but I have spoken with quite a few bearded guys who don’t want a scented oil. I have to say that the incredible thing about ‘The Beard and the Wonderful’ is their prices, Beard care products can range from reasonable to ridiculous, there are many guys out there who can’t spend money on beard care. This oil comes in a 15ml, 1/2 oz bottle for the incredible price of £2.99 and no that’s not a typing error. 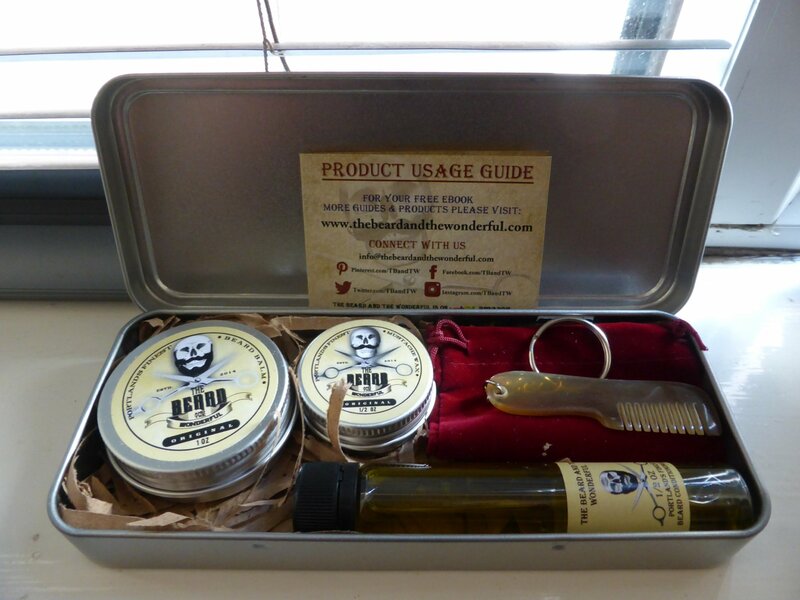 The set that I received for review costs £14.99 and it consists of 15ml Moustache wax, 25ml Beard oil and 30ml Balm in a tin with a mini moustache comb and a travel bag. That is a great gift for a bearded man that doesn’t break the bank! ← Pain has made me unbearable!